Of making many books there is no end . . . I often have a pile of books next to me on the arm of my thinking chair. I am a reader, but not often a book finisher. I find myself grazing introductions, thumbing through pages to look for visual inspiration or just reading the table of contents to see which chapter I might like to nibble on. 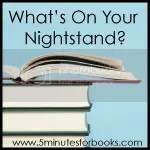 The pile of books, I picked for this month’s link up at What’s on Your Nightstand, inspire creativity. Water Paper Paint by Heather Smith Jones. A beautifully illustrated book on exploring creativity with watercolor and mixed-media. I love the colorful examples and how each chapter presents a project to experiment with a technique. The Creative Family by Amanda Blake Soule. I don’t have a young family at home anymore, but I love Amanda’s desire to make homemade treasures with and for her young ones to explore life through nature, literature and creativity. I definitely want to sew the tote bag for pjs with a bedtime book pocket, for my nieces and nephews. She has two other books that I recommend if you want to explore your own childlike creativity in a simple, seasonal way: The Rhythm of Family: Discovering a Sense of Wonder through the Seasons and Handmade Home. Amanda and her husband value family, nature and creativity. Their ideas honor our Creator. Some of their traditions appear more in line with venerating nature rather than God, yet I respect their values and recommend these books for anyone looking for high quality items to make with and for your family. I borrowed her books from our local library. 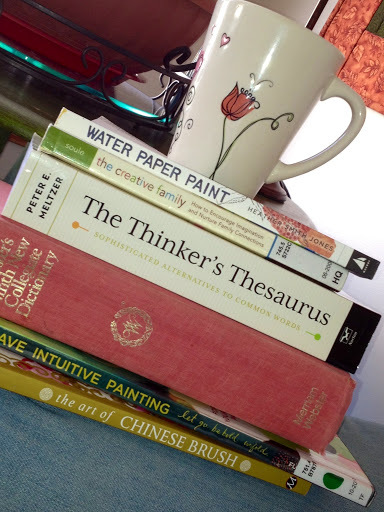 The Thinker’s Thesaurus compiled by Peter E. Meltzer. When I recently browsed the reference shelf at a local bookstore, I immediately knew I was going to add this thesaurus to my own collection. A thesaurus, yet another favorite companion of mine. I do love a synonym for enriching my vocabulary. This thesaurus is not your common garden variety, either. The subtitle sells it as offering the reader, “Sophisticated Alternatives to Common Words.” This one is definitely a vocabulary builder, rather than a pure word swap type thesaurus. Some of the synonyms offered are actually Latin or French phrases. A sample sentence with the new word in it, aids my understanding immensely. I have my red Webster’s dictionary nearby, as many of these words are beyond my knowledge. Definitely a luxury, but I think it will be a nice addition to my circle of friends. Brave Intuitive Painting by Flora Bowley. I love the selection of art technique books available at our library. This one is a visual feast, and if I weren’t on a new kick to be frugal, I would buy this one. I think of these books as grown-up versions of picture books. I ingest the words, but the pictures feed my mind and creativity, as much as the instructions of the author. This particular book appealed to me as I explore the unknown territory of painting. I am not a trained painter, but I do believe I am an artist who expresses her self in various venues. This book has helped me to “Let go. Be Bold. Unfold,” as the subtitle invites. Pretty bold, don’t you think? But seriously, have you ever looked at the intricate, unique design of each popped kernel? A credit to our glorious Creator! Last but not least, I bought this bargain book, The Art of Chinese Brush. Yes, another pictorial primer to add to my creative repertoire. Art journaling is enhanced by calligraphy, so I am on a quest to discover my style. I apologize for the lengthy post, but I hope you enjoyed these hearty appetizers this Thrilling Thursday. I actually have stared at popcorn and noticed how each kernel looks different. I love your blog! I did actually look at a few pieces of the popcorn closely that I was eating last night!Good for you for following your passion! You go girl! I have a red Webster's dictionary in my living room, my study and next to my bed. Smile.and this was not an overly long post–just enough. Smile again.